Brian Campbell retires, joins Hawks Front Office. Brian Campbell played over a 1,000 games in 17 seasons, winning one Stanley Cup. *The Blackhawks already traded Trevor van Riemsdyk and lost both Niklas Hjalmarsson and Johnny Oduya. And while Campbell was left to sit on the free agent market since his one-year deal expired on July 1, his loss still magnifies the Hawks need for some veteran presence on defense. *Campbell played over a 1,000 games in 17 seasons, winning one Stanley Cup-in 2009-10. 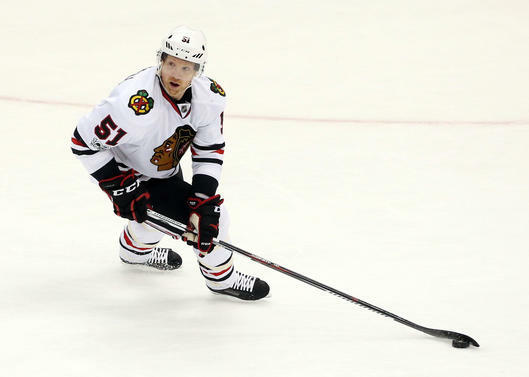 Campbell noted after the 2016-17 campaign that he’d either return to the Blackhawks or hang it up, so his departure isn’t exactly surprising, but it still makes for notable news after a 1,082-game career that included 504 points and a Stanley Cup win between four teams.Campbell can be considered a Blackhawk for life.It’s not often a blue-liner of Campbell’s caliber and durability spends such a long time in the NHL before playing for a franchise he truly can call home. He spent nearly eight seasons in Buffalo — with a brief sting in San Jose — before landing in Chicago. Even after he was dealt by the Blackhawks to the Florida Panthers for salary cap room, a move that followed up three years’ worth of playoff contributions, the D-man kept a house in Chicago, and took a discount to come back to in 2016-17. Now, as he heads into retirement, he’s embracing a marketing spot in the team’s front office.The Hawks offseason has been all about nostalgia.Talk about a nostalgic summer for the Blackhawks. It’s up to you to decide if it’s been a good one, too. Before Campbell made his announcement and made his quick transition to the front office, the team made headlines for welcoming back several ex-Blackhawks in free agency and through trades, including former Jonathan Toews line partner Brandon Saad. Only time will tell whether or not Chicago’s blast from the past will pay off in a question-filled 2017-18 season. The Blackhawks annual Fan Convention started Friday at the Chicago Hilton & Towers.